Surveyors examining a refrigerated cargo ship which was battered by a storm off Cornwall have found an 18ins (0.46m) hole in her side. Seven people had to be airlifted off the Horncliff, including the ship's captain, when she was struck by a huge wave in a force 10 gale. There were 31 passengers and crew on the ship, which was travelling to Dover with a cargo of fruit from Costa Rica. She is moored in Falmouth harbour and is being inspected by coastguards. Violent waves struck the vessel about 225 miles (360km) off the Isles of Scilly on Friday. The Lithuanian skipper suffered back injuries - but had to spend a night in agony on board the ship after an attempt by a helicopter from RMB Chivenor in north Devon to airlift him off was abandoned when it became too dangerous. On Saturday morning, a helicopter from RNAS Culdrose in Cornwall was able to reach the ship which was by then 70 miles (110km) off Land's End. 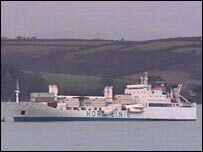 The vessel, which lost about 90 containers in the storm, came into Falmouth on Saturday night and a Maritime and Coastguard Agency (MCA) surveyor boarded the vessel to carry out an initial assessment and assist the crew. As well as the hole, coastguards said the ship had taken on some water. Ballast was pumped out of the ship to raise the hole clear of the water. The ship had also lost her anchor and heavy duty mooring equipment has been supplied to keep her safe in harbour. The Maritime and Coastguard Agency said: "On Monday morning, insurance underwriters will arrive at the ship to assess damage. "A crane barge will be brought in to lift and secure containers, and a diving inspection will be carried out to assess damage which may have been caused by containers." After the work has been carried out on Monday, temporary repairs will begin in order that the ship can sail to Antwerp. Coastguards said a warning had been given out to shipping in the south western approaches to be aware of containers in the water. "There is a danger from the containers but we don't know how many will sink or how many will float for a time," a spokesman said. The Horncliff, a 12,887-ton cargo ship which is flying the Liberian flag, was built in 1992. Three of the people who were injured are still being treated at the Royal Cornwall Hospital in Treliske, Truro.